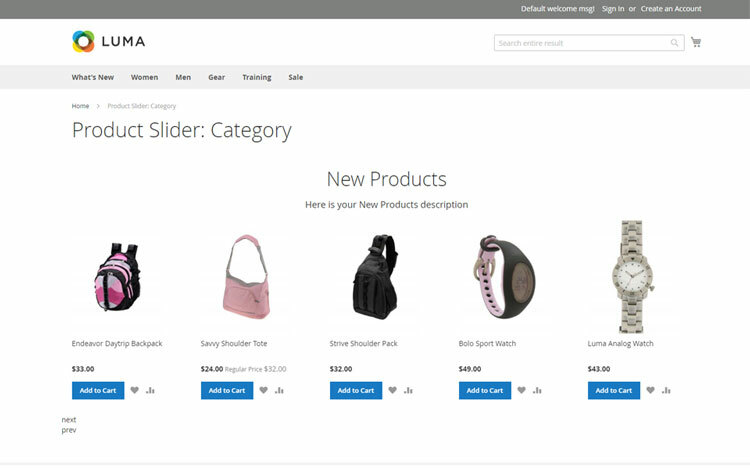 Magento 2 Product Slider module allows showing all suggested products friendly that match to customer’s expectation. By Magento default, your products will be listed without any purpose. In this way, you are equating all of them, that means there is any interest or desire your visitors feel when going to your store. That is the reason why Mageplaza develops Magento 2 Product Slider extension to help you revolute the performance of goods more professional and attractive. 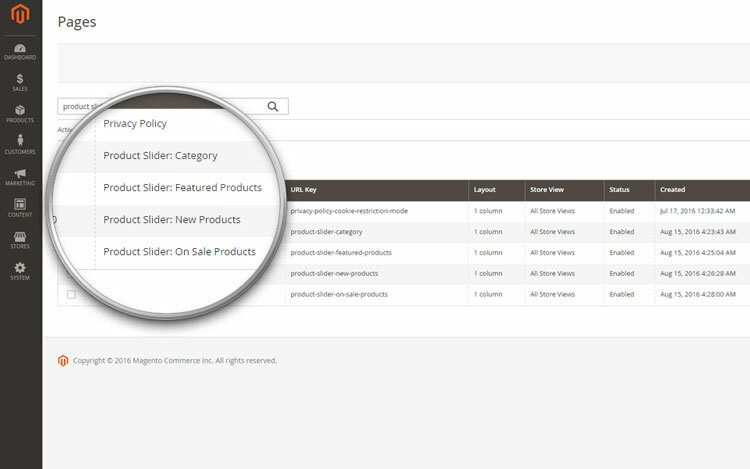 Instead of the standard listing, Magento 2 Product Slider allows creating many slider titles such as new products, bestsellers, featured products, or most reviewed products including the corresponding items. Putting things into the product slider is a great functionality to highlight them and create more sales with ease. When you enable Magento 2 Product Slider module and create the product sliders in the configuration, lists of your products will slide out in the lively and attractive way on the storefront with the animation effects you have chosen before. Along with product image, your clients can also see the price information, rating for the product and even Add to Cart button to proceed to the checkout whenever they need. With Product Slider for Magento 2, the slider display is free to custom how to be friendly with any touch devices like iPhone and iPad. You can set the breakpoint, the large, medium and small display to design the best performance. To create a vivid slider, you can allow sliding out in the animation effect, so the product slider will auto-scroll and auto-move to the next product list without the click. Along with the performance of the slider, you can make individual product elements visible like name, price, rating, add to cart button, wishlist and compare links, etc. With a full of product information, it is easy to have a perfect look as well as create a new purchase quickly. If not, let hide them. When Product Slider extension optimizes the product view, Magento 2 Checkout extension establishes an advanced checkout page for your store. Instead of two checkout steps as usual, your shoppers can finish purchasing on one page only. Mageplaza Layered Navigation is a perfect tool to allow your shoppers search the products speedily and trustfully. In fact, Layered Navigation together with Product Slider extensions will be a perfect assistance which let shoppers love your products even when they have not seen them in detail. Support all browsers: Firefox, Chrome, IE, Safari Opera. The extension is working perfectly. I am happy with your work. This product is so easy to customize and work with other themes without any problem. Thank you so much Mageplaza Team! We got so much complaints from clients that they need to use arrows to find products. We have found this extension and with the installation that was super easy, we have managed to resolve this issue. Slider works fine on all browsers and clients are happy. One of the best free extensions on the market I have ever used. Great features with custom options. I am very satisfied with the Product Slider. I am sure it will improve our website's user experience. I really recommend it to anybody looking for a function like this. Tremendous and amazing support. I always prefer Mageplaza extensions just because of its awesome support throughout the period till all the bugs are resolved. 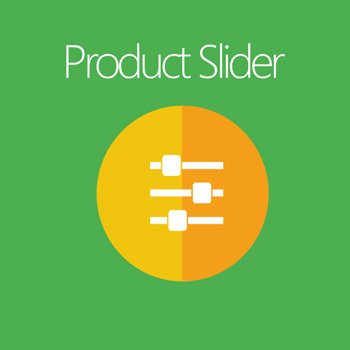 Product Slider Module is a very good module. It is very easy to implement. It uses very easy simple steps to for implementation. This module is very helpful for me. One of the best free extension on the market I have ever used. I really recommend if you need a function like this. It has a lot of options like showing best seller products, most viewed, etc. Once again, thanks Mageplaza! I used Product Slider extension. It was very helpful and the developers from Mageplaza is very good at solving issues. It was well working with our theme. I recommend to every Magento developer who needs this extension. Thank you! If you only want to create this slider through the plugin's "Product Sliders" section and add it to all pages, or categories, then this plugin is really good and provides a lot of options. It falls short, however, if you want to insert it as a widget, or block within a CMS page (Or template). A lot of the options aren't available through the widget or block, such as showing the product price, add to cart button etc. Basically, most of what makes the plugin useful is missing. There's also, currently several bugs that actually break it when using a block snippet. On the plus side, the code is open source, so it can be modified. I've fixed the breaking bugs, and added some of the missing options into the block snippet functionality, and have a pull request waiting for them to merge in. So hopefully the next release will have a few of these things fixed and it can get a higher ranking. This product helps me to add Product Slider flexible on CMS page. It is working great with all owl carousel's attributes. Also, it is easy to add with custom modifications. I have tested it in Magento 2.2.3. it's working fine and a great extension for Product Slider. It is working great with all owl carousel's attributes. Also, it is easy to add with custom modifications. Great features with custom options :) I am very satisfied with the Product Slider. I am sure it will improve our website's user experience. I really recommend it to anybody looking for a function like this. One of the best extensions I used for Product Slider with a vast range of options. It works great on Magento 2.2.0. I really recommend it to everyone who is looking for a function like this. This module is good but I need the slider widget, not the extension. Though I am new at Magento 2. I used it in my custom theme. It has a number of sliders best sellers, new products. I've seen several versions from other companies, and overall, I preferred MagePlaza's version; however, like all the others, it is missing one element that I feel would be quite useful. ALL featured extensions link directly to and are based on a direct selection of products. Thereto, they all take the BASE image as the image of choice to be used on the featured slider. My suggestion - and one that I think would push this extension well above the rest - would be to build in the ability to choose an image of your choice; that is, even one that is listed in the product's list of images (via drag & drop or upload. Additionally, instead of requiring the product's store URL, the ability to input a different URL - say, a static page - would also be useful.) Other than this, I'd recommend this feature product extension over everyone else's. Nice job, guys! This food product is so easy to customize and work with other themes without any problem. I can use it with featured products and new products. And the best of all is that this module is free. I will strongly recommend. One of the best extensions I used for Product Slider with a vast range of options. It works great on Magento 2.2.2. I really recommend it to everyone who is looking for a function like this. This extension is very helpful for me. It has solved my major problem regarding the product display on the slider. Now it is working great on Magento 2.2.6. I really recommend it to anybody looking for a function like this. This extension is very fast and simple to use. I am pleased with most extensions I have purchased and downloaded from Mageplaza. The extension works perfectly with the Infortis Ultimo Theme. This extension improves my rate store and attracts more customers. Thank you so much. This product helps me to add product slider on any CMS page. It is working great with all owl carousel's attributes. Also, it is easy to add with custom modifications. It's not Displaying Configurable product Swatch option. One of the best extension I used for product slider with a vast range of options. Works great on Magento 2.2.2. I really recommend it to those looking for a function like this. Works very efficiently, and very easy. I'm happy with this extension and other I had purchased it. Best extensions are given by Mageplaza. The extension works perfectly with the default theme. This extension improves my rate store and attracts more customer. Thank you very much. Your support service is very good. And the extension is working nice. I'm happy with your work. This is a nice extension and we can fulfill multiple needs using this extension. This Magento 2 extension gives a nice look to products in sliding way we can use this extension with multiple themes . Thank you so much, that help me to easy to handle my project. I will keep use the related product in the further. Your team so nice to help me and let me know any news. I think we will have any problem to ask for your team in the further, I hope your team will keep to help me. Unfortunately, the extension doesn't work for me as expected and the documentation is not clear enough leaving you with doing plenty of tests and guessing. Good Extension! I like it. Thank you. Good Extension! I like it. Extension product slider working excellent! The extension is working nice. I'm happy with your work. Best extensions are given by Mageplaza. The extension works perfectly with the default Luma theme. This extension improves my rate store. This a great extension! It's very interesting and helpful to my store in many aspects. Thank Mageplaza team for this free extension that makes better magento community. This extension improves my rate store. One of the best extension one can use. Thank you for this help. Remember the name - Mageplaza Extension! Greatness of this extension is pretty high. The world-class module for Magento 2. Honestly, this extension is the coolest extension to increase user experience in your website and improve the conversion rate. One more thing, whenever you install this extension please don't forget to take the backup so that you will not regret in future for not compatible with your theme or any other reason. Added a new simple template Developer can custom it.